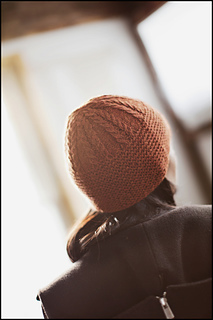 This hat features a deep garter stitch brim and a crown of slipped stitch horseshoe cables. 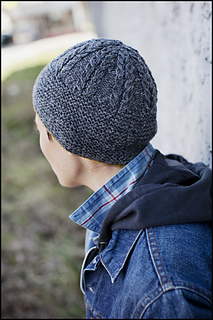 The grey version shown here in the colorway Soot includes optional short-row shaping to lower the earflap and back neck length for a warmer version. The hat here in Soot is also shown with an accent color trim at the base of the brim. 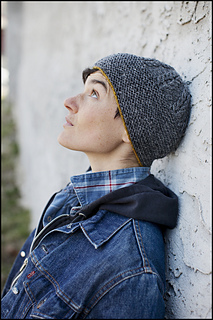 If you wish to add this accent, you will need a few yards of yarn in a contrasting color to begin your hat. Pattern includes instructions for Small (Medium, Large) to fit head sizes 19-20.5 (21-23, 23.5-25)“. Please note: the cable pattern in this garment is charted only.